Not all real estate auctions are sad and anxious moments synonymous with desperation and bankruptcy. For years, auctions have been a convenient, private and efficient method of moving inventory in a hurry — especially for companies that need to clear properties from their books by a specific date. For them, it’s simply a matter of sound business economics. Corporations, public agencies and institutions routinely liquidate “real estate-owned” portfolios to free up cash for other projects. These sellers are not usually affected by interest rates or economic environments, but the past few years have been atypical and the conditions have definitely added more properties to inventories. The acceptance and success of real estate auction sales has become a primary method of choice in disposing of property. Traditional auction companies are enjoying a brisk business, not only from companies and individuals looking for a swift disposition but also from savvy buyers looking for a long-term bargain property. Some investors have taken advantage of real estate opportunities by pulling their funds from other shaky investments and restructuring their portfolios to include a great deal on a home, apartment, vacant lot or timber parcel. Realty Marketing/Northwest has acted as the auction marketing for huge national corporations such as Weyerhaeuser and The Nature Conservancy. The company not only represents individual owners of small recreational and residential properties, but also regional lenders, builders and developers with commercial, industrial, ranch and timber parcels. Realty Marketing was founded 25 years ago and is now the oldest, continuous real estate auction marketing program in the Western U.S. The company was recently ranked No. 4 in America’s top 25 auction houses by The Land Report, a publication specializing in disposition of surplus lands throughout the country. Realty Marketing typically holds major auctions in the spring and fall every year along with supplemental campaigns featuring entire resorts. On the auction block in the company’s spring sale are properties in Washington, Oregon, Idaho, California, Texas, Arkansas, Louisiana and Florida. Traditional auction houses bundle several dozen properties, charge sellers an upfront fee (often 10 percent of the sales price) and then conduct an intense marketing campaign aimed at a specific sale date. Their message to sellers is that they can put an end to insurance, tax and maintenance costs by selling on a predetermined day. Auction catalogs typically contain descriptions and photos of the properties, site and unit plans, and location maps. Terms and conditions of the auction sale are provided in detail, including financing, hours for inspection, deposits required and closing procedures. 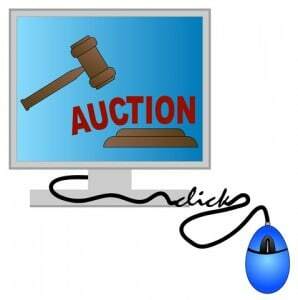 The auction is also a way of determining what a property is worth. Different people bidding openly against one another is a genuine method of establishing true market value. Minimum bid: Seller has agreed to accept the highest bid that is equal to or greater than the published minimum bid for each property. Absolute bid: The property is sold to the highest bidder; no minimum bid has been set. Reserve bid: When the bidding equals the amount of a published reserve, the seller is committed to sell to the highest bidder. If the bidding falls short of the published reserve, the seller reserves the right to accept, counter or reject the bid. Most of the auction sellers will carry financing with a 20-25 percent downpayment. As usual, cash talks, so keep that in mind when negotiating terms with the seller.